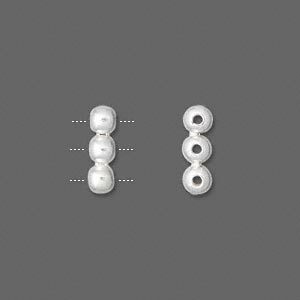 Spacer bead, sterling silver, 3 holes, beaded rondelles. Sold per pkg of 2. 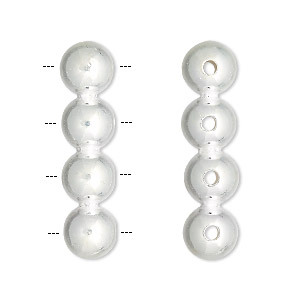 Beaded rondelles approximately 3mm hole with 8mm outside diameter. 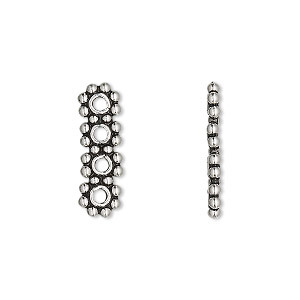 Spacer bead, sterling silver, 4 holes, beaded rondelles. Sold per pkg of 2. 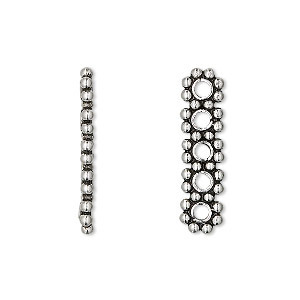 Spacer bar, sterling silver, 12x4mm 3-strand round. Sold per pkg of 2. Spacer bar, antiqued sterling silver, 16x5mm 4-strand beaded rectangle. Sold per pkg of 2. Spacer bar, antiqued sterling silver, 20x6mm 4-strand beaded rectangle, 5mm between holes. Sold per pkg of 2. Spacer bar, antiqued sterling silver, 9x5mm 2-strand beaded rectangle. Sold per pkg of 2. Spacer bar, antiqued sterling silver, 24x6mm 5-strand beaded rectangle, 5mm between holes. Sold per pkg of 2. Spacer bar, antiqued sterling silver, 20x5mm 5-strand beaded rectangle. Sold per pkg of 2. 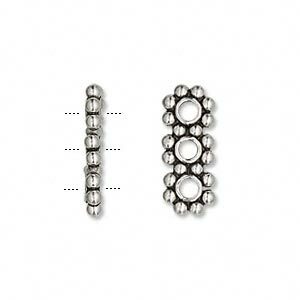 Spacer bar, sterling silver, 4-strand 8mm round. Sold individually. 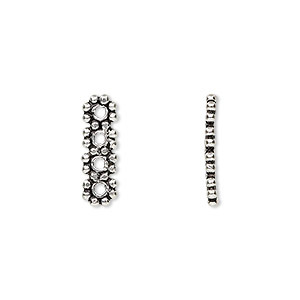 Spacer bar, antiqued sterling silver, 10x6mm 2-strand beaded rectangle, 5mm between holes. Sold per pkg of 2. 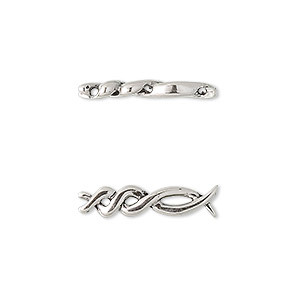 Spacer bar, sterling silver, 21x5mm 3-strand braid. Sold individually.